A striking new look paired with practical functionality. 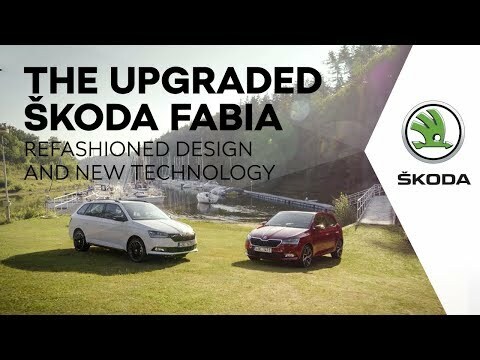 The new and stylish ŠKODA FABIA offers clever connectivity, robust safety features as well as an outstanding new look. The new FABIA turns heads, inside and out. Always stay connected while on the road, play your music and receive calls whilst using the navigation services, thanks for SmartLink+. Packed full of active and passive driver assistance features as standard, helping to keep you and your passenger’s safe at all times. Finance: *At the end of the agreement there are three options: i) pay the optional final payment and own the vehicle; ii) return the vehicle: subject to excess mileage and fair wear and tear, charges may apply; or iii) replace: part exchange the vehicle. With Solutions Personal Contract Plan. 18s+. Subject to availability & status. T&Cs apply. Model year 2019 only. FABIA MPI 0% and 4.9% APR finance offer available on stock models only when delivered by 30/06/2019 from participating retailers. Excludes Colour Edition, TSI variants and model year 18. Excludes model year 18. Indemnities may be required. ^Service plan covers first two consecutive services limited to 1 x Oil and 1 x Oil and Inspection service. Not available in conjunction with any other offer and may be withdrawn at any time. Accurate at 04/2019. Freepost ŠKODA Financial Services.